Welcome to Monocacy Brewing Company where our focus is on crafting quality beer. We are proudly brewing our award winning beers in the old Ebert’s Ice Cream plant located in historic Downtown Frederick. At Monocacy Brewing Company we strive to be a great neighbor and representative of Frederick’s local allure. 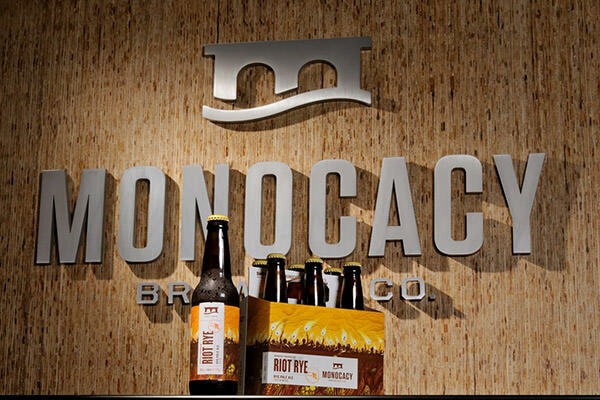 Opened for production in November of 2011, Monocacy Brewing Company crafts unique, full-flavored ales and lagers. Our staff of talented and experienced brewers are committed to promoting the use of fresh, local ingredients and releasing a portfolio of beer styles that appeals to all beer drinkers’ tastes The brewery also functions as a contract bottling facility for Frederick County’s original brewpub, Brewer’s Alley. The exceptional gift of our production team is realized when each bottle and glass of Monocacy Brewing Company beer gets served. Our brewery and tasting room are open to the public. Join us for one of our regularly scheduled brewery tours and enjoy a taste of a flavorful and genuine Maryland beer. During public hours, we are happy to offer growler fills of our draught beer. We’ll fill any 2L German-style growler glass growler that features a swing top and double-wall, vacuum insulated stainless steel growlers that feature a permanent government warning are also able to be filled. If you have any questions about your growler, please feel free to contact us via Contact Us. Quality beer. It’s in our nature.